Arabic is 'the poetic language', full of metaphors, metonymies, signs, and similes, which are common even in the vernacular language. This dictionary, the result of years collecting, writing and translating countless phrases and expressions and words, is one of a kind. 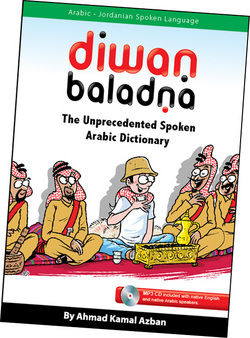 Published in May 2011, this long-awaited book provides the perfect follow-up to Diwan Baladna: Arab Culture from an Arab's Perspective. It promises to provide the reader and student of Arabic - or the Arabic speaker learning English - with spoken expressions that will allow them to drastically improve their fluency. Greetings and phrases for everyday occasions - for long-lost friends, for hosts and guests, farewells, praise, thanks, requests, compliments, and phrases used at funerals. Modern colloquial expressions and idioms - for giving and taking advice, making decisions, friendship, food, money and work. Expressions and adjectives to describe people - positive, negative and neutral characteristics. Traditional sayings - including advice and warnings, consolations, comments on human nature, phrases regarding conflict. More than 45 topics- the second part is a dictionary of vocabulary, separated by topic and covering every conceivable eventuality. Please note: the book is accompanied by a CD, and is most suitable for students who can read Arabic, as phonetic transcriptions are not included.